Alison Whyte in The Bloody Chamber. Photo by Jeff Busby. Entering the theatre one can just make out dark stains on the stage floor. Drop by drop a puddle of water forms between three monolithic black cubes. Occasionally a tone like struck metal rings out. The sounds rise and fade, accompanied by the dead percussion of wood. Suddenly, with a rattle of chains, one of the cubes starts to rise. It stops just high enough to reveal the pedaling feet of three harpists, the source of the wooden sounds. The gong sounds (produced by putting Blu-Tac on the harp strings) increase in intensity as the harpists run their hands down their wire strings, producing harsh whispers like the falling blades of guillotines. Then, slowly, the smallest of the three boxes rises to show two feet dripping with blood. The box continues to rise, carrying the gently twitching feet high above the pool of blood below. We are inside Bluebeard’s castle where, according to the seventeenth-century version of the tale by Charles Perrault, a sadistic aristocrat has murdered a series of wives for disobeying his one proscription: Do not enter the forbidden room. Showing a propensity for divergent characterisations of violence, the story has since been rewritten many times, notably in Bartok’s 1911 opera and Angela Carter’s 1979 short story on which the Malthouse production is based. The original cautionary tale assumes a male monopoly on violence for the punishment of woman’s supposed innate and sinful curiosity. Violent punishment is also meted out between men, as the young wife’s brothers save Bluebeard’s youngest wife, the protagonist of the story. Bartok’s interpretation plays down the cautionary tale to focus on the symbolic violence of Bluebeard’s capricious affections, his love of the idea of his wives over their reality. Bluebeard cannot truly admit the new wife into his shuttered castle, initially refusing to let her open the doors and let the light in. When she finally convinces him to do so, she finds the wives alive. The young wife is then similarly enshrined in jewelry and locked away. The castle is no longer a moral prison, but a cold, damp, dark psychological world. Without forgetting punitive or symbolic violence, Carter elaborates the sexual violence inherent in the tale. An array of mirrors shatters the protagonist into twelve identical copies that are “impaled” in a honeymoon chamber decked with lilies, a symbol of death. 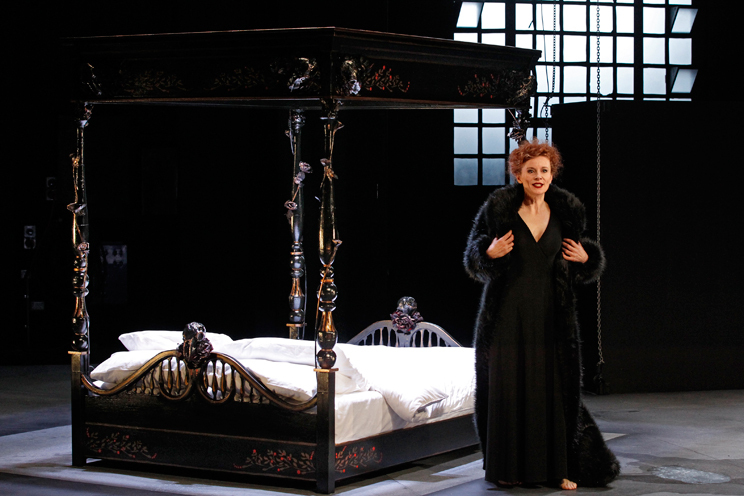 In Lutton’s production the bedroom is hidden under the third cube and consists of only a carved four-poster bed. Alison Whyte shifts effortlessly between Bluebeard’s menace and the new wife’s fear, playing both parts with the help of a finely-tuned pitch-shift effect by sound designer Jethro Woodward. Carter returns to the violence of punishment by having the young wife’s mother ride to the rescue, her skirts tucked around her waist, a backdrop of ocean spray “witness to her furious justice” as she shoots Bluebeard in the head. In Lutton’s production this moment is punctuated by a veritable rain of bullets upon the stage. While punitive violence ultimately saves the day, the story’s happy ending is predicated on symbolic non-violence. Bluebeard is initially attracted to the new wife for her conservatoire training as a pianist. It is an “accomplishment,” a symbol by which Bluebeard identifies her, placing a Bechstein in the mirrored room. Carter then shows how music can function as something other than a sign of accomplishment, as a bridge between people and a fundamental part of one’s identity. The new wife is able to calm herself by playing Debussy and Bach. The piano also leads her to the blind piano tuner Jean-Yves, with whom she will open a music school after they are both liberated by her gunslinging mother. The three harpists of Lutton’s production (Jacinta Dennett, Yinuo Mu and Jess Fotinos), representing the three dead wives, extend Carter’s musical theme. Since its feminisation in the late eighteenth century, the harp has inhabited a space of both convention and transgression. While the harp upset a woman’s deportment in the most suggestive ways, it also became the accomplishment par excellence for young women leading up to the French Revolution. As the instrument became larger, heavier and the strings tighter, its physical demands became greater and so women had to fight against a quantity that continued to claim that the instrument was unsuitable for feeble female hands. At times Chisholm’s music fills out the sparse set design, such as where the harpists sing drones over tremoli to evoke the monotonous train ride to the castle. Then, arriving to a dawn sky “scattered with rose-pink,” the harpists unleash a pointillistic flurry of notes. At other times the harpists superimpose the new wife’s alternative psychological world on the dark castle, playing whimsical, dissonant tunes as she traipses around the castle playing with her new riches. Finally, after supporting Whyte, the harpists assert their own identity, literally packing up their bags and leaving the stage. As Carter has said, her rewriting isn’t about men and women, but about “tigers and lambs,” a dynamic as relevant today as it was thirty years ago.